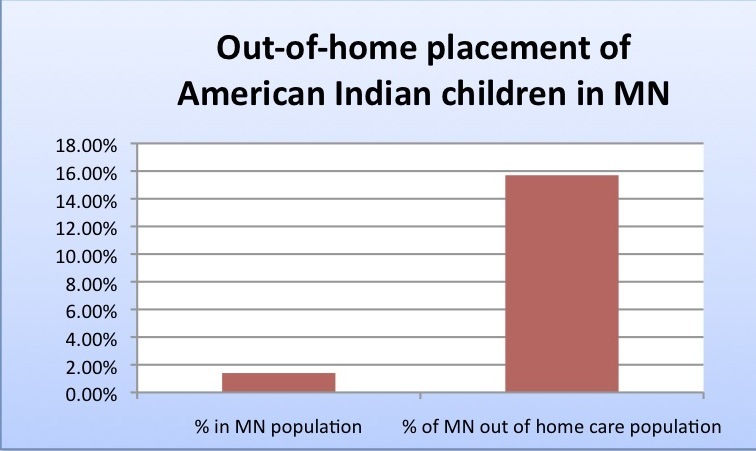 Increasingly, American Indian children in Minnesota are ending up in foster care, according to a study recently released by National Council of Juvenile and Family Court Judges. The study found that across the nation, children of color — especially African American and Native American children — are entering into foster care at higher proportions than the general population. The study uses the “disproportionality index”, developed by Robert B. Hill, which divides the proportion of children in foster care of a given race by the proportion of the children from that racial group in the child population. If the calculated ration is greater than 1.1, that that population of children has a disproportional representation in the foster care system. The two racial groups in Minnesota that were calculated to have disproportional representation of children in the foster care system in 2009 were African Americans, with a 2.5 ratio, and Native Americans, with an 11.6 index. The ratio for African American children had decreased from 3.6 in 2004, but the ratio increased for Native American children, up from 7.3 in 2004. As a comparison, white children had a ratio of 0.6 both in 2004 and 2009, Asian children remained steady at 0.4, and Latino children decreased from 1.4 to 0.8. Another study published in 2010, supplied by the Minnesota Department of Human Services, the Minnesota Child Welfare Disparities Report, gives statistics about the disparities in the greater child welfare system. That study found that American Indian children were more than eight times as likely to be subject of a neglect report, and African American children were five times more likely. The report also found that American Indian children were placed in out of home care in 2008 at a rate “more than twice that of any other group, and [were] more than 12 times more likely than a white child to spend time in placement.” African American children, meanwhile, were 5.3 times more likely than white children to end up in out of home placement. The history of Native American children being taken from their homes is long and complex. Janice LaFloe, from the American Indian Family Center (AIFC) attributes the high disparity of Native American children in foster care to the specific needs of the community. “When you take a look at the history of who American Indian people are, there’s a significant distrust of any system,” she said. For years and years, American Indian people have worked together to protect their community, as decisions were made for them, through the signing of treaties and breaking of promises, through the forced system of tribal governments and the forced assimilation of taking children into mission schools, according to LaFloe. Probably the most disturbing part of this history were the boarding schools that Native American children were sent to beginning in the late 19th Century and continuing throughout the 20th century. “The forced removal of children to go to boarding schools was the most detrimental thing you could have done to Indian community,” LaFloe said. “There was a whole generation or more of children removed from their homes. The amount of abuse that happened to children in those boarding schools led to a perpetual cycle of learned behavior that surfaced and continues to play out.” According to LaFloe, boarding schools undermined traditional ways of raising children. Children were also taken out of their homes at high rates and placed with non-Native families. According to B.J. Jones’s “The Indian Child Welfare Act: The need for a separate law,” published in 1995, before the Indian Child Welfare Act (ICWA) was passed in 1978, “as many as 25 to 35 percent of the Indian children in certain states were removed from their homes and placed in non-Indian homes by state courts, welfare agencies, and private adoption agencies.” In Minnesota, a quarter of Native American children were removed from their families and placed in non-Native homes, according to Jones. In 1978, the U.S. Congress enacted the Indian Child Welfare Act, which gave tribal governments more of a say in child custody cases that involved Native children. According to the National Indian Child Welfare Association’s Website, ICWA allows a child’s tribe and family to be involved in decisions for the child, and they can petition to transfer jurisdiction of the case to tribal court. A child must be a registered member of a tribe to apply for ICWA. Under the law, caseworkers must provide “active” efforts to the family (such as providing services to the family to prevent removal of an Indian child and reunifying a child with their parent/custodian), and must involve the participation of the child’s tribe in planning decisions, according to the website. Poupart has personal experience with the issue. He watched his sister, as a teenager, placed in numerous homes, and ending up committing suicide. “It’s a reminder of the failures of the system,” he said. According to Poupart, the problem isn’t that people aren’t following the ICWA. “People are following the law, but it hasn’t impacted the numbers,” he said. According to LaFloe, every county in Minnesota handles ICWA a little bit differently. AIFC has been working with Ramsey County for a few years through a program called Nokomis Circle to specifically address the issue. “There are time limits about what you have to get accomplished in order to get the child back,” she said, which often amounts to a year or less. If there’s addiction, and a family needs to go through treatment, a year isn’t enough time. Erin Sullivan Sutton, the assistant commissioner for Children and Family Services at Minnesota Department of Human Services, said child protection is just one of the issues that affect Native American disproportionately. Other areas include health and criminal justice. According to Sutton, out of home placement was 94.1 per thousand in 2001, whereas it was 78 per thousand in 2010. According to Sutton, the areas where the most children are placed out of home include Minneapolis and Duluth. Leech Lake and White Earth also have high rates. A child’s “safety” is the key, according to Poupart. “It’s a very constrictive word… if the dishes aren’t washed, the floors aren’t swept… you have to ask what is behind that?” Perhaps there are beer cans or alcohol present, or children have thin outerwear for winter months. “These are the norms for poverty-stricken people,” he said. According to Dawn Blanchard, one of the goals of DHS is core foundation training. She hopes that DHS can partner more closely with University of Minnesota on social work training. “Education is key,” she said. “American Indian kids have highest the dropout rates. We aren’t getting American Indians going into this field.” She said the only institution that specifically trains social workers in ICWA is the University of Minnesota- Duluth program. Is there a need for a statewide system? Blanchard says her office has said to the legislature that what is really needed is a state-based system, which would make it more consistent. “That is the biggest first move,” she said. Kelly Sarenpa advocated for the White Earth and Leech Lake tribes to handle their own child protection cases, and got Hennepin County to sponsor the initiative. According to Erin Sullivan Sutton, the transfer of child protection and welfare matters to the tribes of Leech Lake and White Earth means that any report of child abuse in those reservations becomes their responsibility. The tribe does a child protection assessment, and receives state funds to allow them to have direct responsibility. According to Sutton, there was a slight increase in out of home placements in the two reservations after the transfer, followed by some decrease. The Leech Lake band saw 114 children experiencing foster care in 2008, 158 in 2009, 169 in 2010, and 125 in the first 10 months of 2011. For White Earth, there were 100 children experiencing foster care in 2008, 193 in 2009, and 222 in 2010, according to the SSIS Charting and Analysis. CORRECTION 11/28/2011: According to Sutton, out of home placement was 94.1 per thousand in 2001, whereas it was 78 per thousand in 2010. .. The Leech Lake band saw 114 children experiencing foster care in 2008, 158 in 2009, 169 in 2010, and 125 in the first 10 months of 2011. >People in the court and social systems cannot understand the difference in the two cultures; actually, opposite in many ways. Native culture is based on family and extended family ties. Religious, social and cultural beliefs can be drastically different in practice. There has always been a huge misunderstanding in the Anglo community of the American Indian culture and religious practices. The book is judged, for the most part, on it’s cover and the cover is left open to misinterpretation due to lack of knowledge and understanding, often because of Anglo pride to always be right and dominant. >Utter devastation over takes an Indian child that is removed from their home, family, extended family, culture and familiar surroundings. Fear and confusion replace their support system. The free spirit of an Indian child is frequently misinterpreted by Anglo culture. The child is thrust into a totally unfamiliar environment and expected to adapt immediately. Frequently foster homes have little compassion or understanding for the situation of the child. >Much in the law is left to interpretation in the huge gray area of child welfare and frequently exploited for the sake of politics, finances or pride – at the expense of a child. In an attempt to explain the gray area, laws go into detail that make the situation worse. Most Native people have little understanding of the laws outside their culture. >I will concede that there can be strong reason to remove a child from an immediate situation. Indian Peoples live in extreme poverty with the worst statistics of any demographic in this country. Instead of taking the children and leaving the situation to fester, why not help. It took a long time, and a lot of help, for the Indian to get into his situation. It will take a long time and a lot of help to get him out. BUT, it would be so much more beneficial to the entire socio-economic situation of this country to give him a hand up and out of his situation. No one wants to live in such poverty and substance abuse if they do not have to. And, stop telling him how to live and help him live by his social and cultural preferences. Meet him on his terms and help with what he needs rather than criticize. LISTEN and learn. The American Indian has so much to offer and the average citizen of this country just cannot see that. >Native Children are thrust into a totally foreign environment with strangers, new rules, dress code, a schedule and more nuances than can be understood by anyone not Anglo. Indian children need to be in homes that are in the Native community or, at the very least, understand the Native community. And, I don’t mean those who think they understand the “Hollywood Tribe”. >A vast majority, out of lack of understanding, continue on the path to take the Indian out of the child and annihalate an entire race of people. I know that more native kids are being taken out of the home more because some people are profiting from it. There being told to fill beds in treatment centers for kids. The amount they get for each rule25 assessment and other treatment programs is enough to scam off of and profit out of breaking familys apart. Around $200.+ a day they get to be out of the home. I wouldnt get no were near that amount from the county to help with my kids. Give me 200 dollars a day to take care of my kids, we would be good. Better then good, great. There would be no problems with me and my kids. Im dreaming, cause there is no way the county or state would pay that to familys to help raise there own kids. Why pay that to take them away? That seems backwards to me. I been poor my whole life. I dont take value in money. But it is nessary to live. Im raising future leaders here. But we struggle with the cost of living and other major issues in our community. Residents of East Phillips want less industrialization, more green jobs and space for the community.